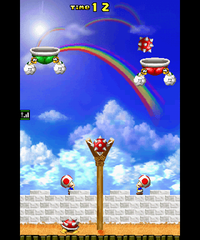 Vs. Lakitu Launch is one of the multiplayer action minigames in New Super Mario Bros.. Since it is exclusive to multiplayer, it can only be played in the Vs. Battle mode. The game plays similarly to the single player version. Players have thirty seconds to launch Spinies into the buckets that the Lakitus are moving in a circular pattern using slingshots. Each of the players has different colored Spinies, however, that must be shot into the correct basket; launching a Spiny into the incorrect basket gives the opponent a point. Players fire the Spiny Egg by pulling the back on the Touch Screen in the direction they wish to fire. At the end, the Spinies in both baskets are tallied, and the player with the most in theirs wins. "Shoot your spinies into the flying shells of the same color. If you land any in the wrong shell, that opponent gets the points!" This page was last edited on December 3, 2018, at 02:12.